5 December 2014 from 3 p.m. – 5 p.m.
Hello, we hope you are having a great afternoon. 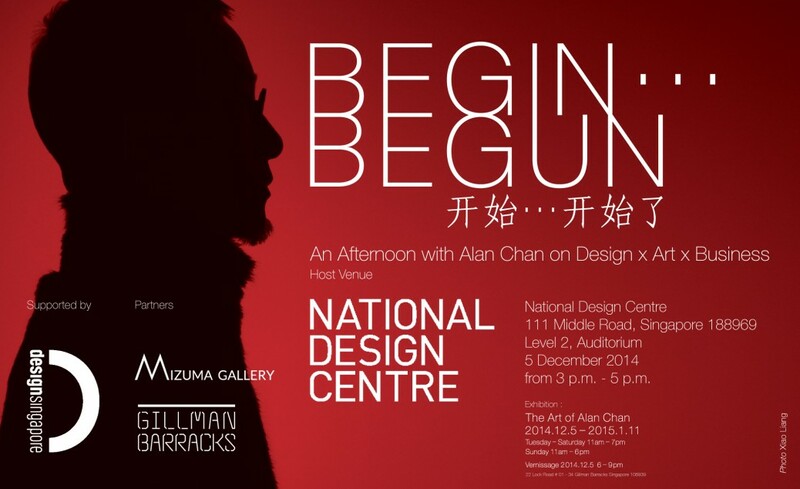 We are happy to announce that Hong Kong based artist, Alan Chan, will be giving a talk on Design, Art & Business at National Design Centre, SIngapore. Alan Chan was born in 1950, he acquired knowledge in design through self-education and became one of the most prestigious and leading designers in Asia. Complemented by 30 years of experience in advertising and design, Alan Chan has won over 500 international and local awards including Designer of The Year by Hong Kong Artist Guild in 1989. In 1996, his company was also selected by the Graphis Press in New York as one of the Graphis Ten Best Design Firms In The World. In recent years, he has expanded his sphere of activity by creating ambitious artwork as a contemporary artist. His concept is to bring back rich images inspired by the 5000-year history of China into the current era with a contemporary feel. Alan Chan will also be present for the opening of the exhibition BEGIN…BEGUN – The Art Of Alan Chan on December 5th from 6 p.m. – 9 p.m.
Don’t miss the talk event and do drop by our gallery for the exhibition opening after! Vernissage: Friday, 5 December 2014, 6 p.m. – 9 p.m.